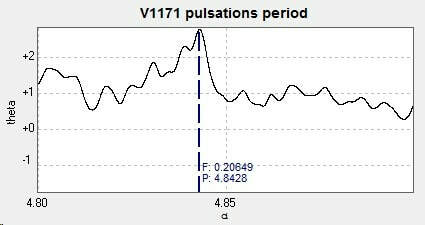 Light curve, period search and phase diagram of the EA type eclipsing binary V1171 Cygni. Constructed from photometry of 79 unfiltered images taken with the Bradford Robotic Telescope Cluster Camera between 2013 July 2 and 2015 July 12. 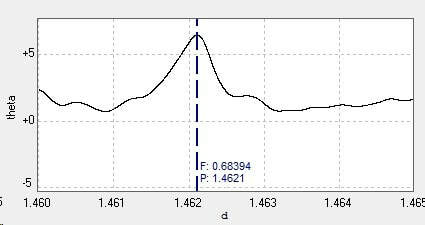 The 'best fit' period for this data and the corresponding phase diagram are shown below. The catalogue period for this star is 1.4621239d (GCVS, AAVSO VSX) and 1.462118d (Kreiner). There is little o-c activity evident with this star (Kreiner). (Accessed 2019 February 8). ​​This star is in the field of my brighter target star V1765 Cyg and the images of V1171 are underexposed. 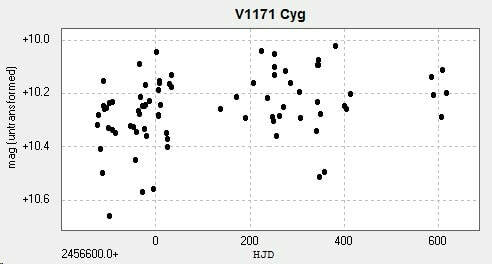 This is responsible for some of the scatter in magnitude, but V1171 Cyg has a pulsating components which also increases the apparent scatter. The period of these pulsations is given as 4.857d (AAVSO VSX) and are detected in this present data with a suggested period of 4.843d.